The Archer possesses below-average health, average damage, and above average speed. While it does not win any contests in terms of survivability or damage, its low cost, fast training time, and range make it a very common unit for use both offensively and defensively. Like its counterpart the Barbarian, the Archer scales well with upgrades and improves noticeably between levels 3 and 4 and 4 to 5. Level 5 Archers are many times more durable than their predecessors, gaining enough health by level 5 to survive getting hit by a level 4 Mortar. As a result of its steady improvement with each level, the Archer remains a viable unit throughout Clash of Clans. 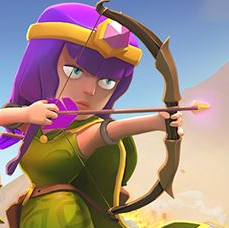 In Clash of Clans, the Archer is a unit which you will use regularly. It is useful as a trophy pushing unit as soon as it is introduced (great for sniping Town Halls in farming base setups). The Archers is also one part of the popular “Barcher” (Barbarian and Archer) army composition. I believe Barcher is the best farming composition at Town Hall 7 and is also useful for low-cost trophy pushing and war battles. Once you find a suitable base that you feel is a worthwhile raid, zoom out by pinching your fingers on the screen. Once zoomed out, you want to hold your fingers down and circle them around the defending player’s base (watch the video to see). This will cause a spam of Archers. Be careful on some bases though. Sometimes you will want to put a fewArchers close together to take out Mortars and Wizard Towers, which can be dangerous to Archers. Always make sure you always have the Town Hall in middle, not on the edge of Walls. Even if yourWalls are doubled, Archers can shoot over the Walls and easily take out your Town Hall for an automatic win. Don’t worry about this if you have a farming base. I will make a tutorial later on how to make a successful farming base against Archer Raids.